FLORENCE, Ky., – At AeroDef 2015, taking place April 20 – 23 in Dallas, Texas, Mazak will spotlight advanced Multi-Tasking technology for complex part production in booth 219. The company will demonstrate its INTEGREX i-200ST machine featuring the new MAZATROL SmoothX CNC. Show attendees will also have the opportunity to learn how MTConnect can be the communication standard for an entire factory. 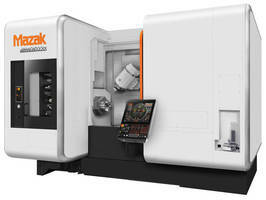 AeroDef attendees will be the first to experience the INTEGREX i-200ST with Mazak’s latest SmoothX CNC. Made for complex, multi-axis machine tools, the company engineered the CNC to offer maximum speeds that are four times faster than previous generation controls. The SmoothX CNC coincides with the company’s new SMOOTH TECHNOLOGY process-performance platform that spans the entire part-production landscape, from programming to metal removal to data collection. As a result, aerospace part manufacturers can dramatically shorten machine cycle times, enhance simultaneous 5- axis operations and more. AeroDef attendees that visit the Mazak booth will also have the opportunity to hear Neil Desrosiers, applications engineer and MTConnect specialist for Mazak, discuss the value of MTConnect, an open, royalty-free standard that is intended to foster greater interoperability between devices and software applications. Desrosiers will explain how data-driven manufacturing intelligence gathered via the MTConnect open communications protocol continues to advance Mazak’s Kentucky manufacturing operations along with the machine tool technology it offers to aerospace manufacturers. Currently, MTConnect is a key enabler of the company’s iSMART Factory concept as well as its SMOOTH TECHNOLOGY platform that encompasses the new SmoothX CNC and latest version 1.3 MTConnect-specification adaptors. To learn more about Mazak’s extensive involvement in the aerospace part manufacturing industry, please visit www.mazakusa.com/machines/industry/aerospace/.